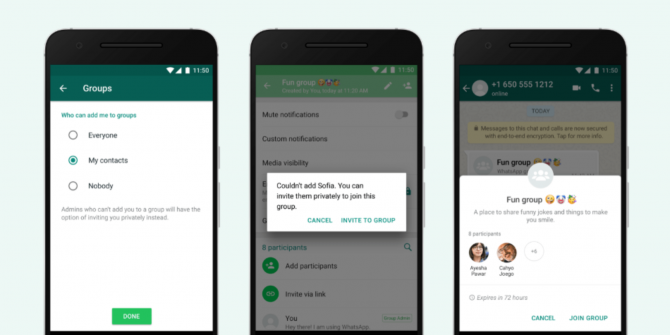 WhatsApp has launched a new feature that prevents people adding you to group chats without your permission. Previously, anyone could add you to a group unless you blocked the group’s admin. Now, however, WhatsApp has put the power back in your hands. In countries such as India and Brazil, WhatsApp has been used to spread misinformation quickly and easily. So, in response, in January 2019, WhatsApp placed limits on message forwarding WhatsApp Limits Forwarding to Fight Fake News WhatsApp Limits Forwarding to Fight Fake News WhatsApp is limiting the number of times you can forward a message. This is an effort to fight the spread of misinformation. Read More . And now it is rolling out new privacy settings for groups. According to the WhatsApp Blog, users have been asking for new ways to control their WhatsApp experience. And WhatsApp has listened. So from now on you’ll be able to choose one of three options with regards to privacy settings for groups. These three options are “Nobody,” “My Contacts,” and “Everyone”. To enable this feature, update WhatsApp to the latest version, then go to Settings. Next, click Account > Privacy > Groups, and select which one of the three options suits you best. “Everyone” keeps things as they are at the moment, with anyone able to add you to a group. “Nobody” means you’ll have to approve joining any group to which you’re invited. And “My Contacts” limits it to users you have in your address book. These privacy controls aren’t particularly granular. WhatsApp could, for example, have let you choose particular contacts rather than lumping them all in together. However, this still represents an improvement over the former system where it was a free-for-all. The ability to control who adds you to groups is the latest in a line of new WhatsApp features The Best New WhatsApp Features You Might Have Missed The Best New WhatsApp Features You Might Have Missed WhatsApp is constantly adding new features. We identify and track the best new features added to WhatsApp over the years. Read More to combat fake news. And it’s unlikely to be the last. Fake news is causing real problems in the real world, so any attempt to fight it should be applauded.